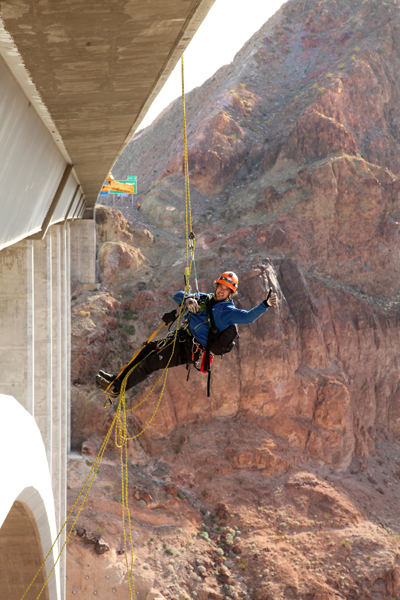 Trask Bradbury of Gemini Rope Solutions gives the thumbs-up while rapelling off the Mike O’Callaghan-Pat Tillman Memorial Bridge (Hoover Dam Bypass) during a routine biennial bridge inspection. The concrete-steel composite arch bridge looms 840 feet above the Colorado River and is the 2nd largest bridge in the United States at 1,900 feet in length. The long arm of a Nevada DOT bridge inspection truck descends down and around the Mike O’Callaghan-Pat Tillman Memorial Bridge (Hoover Dam Bypass) delivering bridge inspectors to their work on a routine biennial bridge inspection. The concrete-steel composite arch bridge looms 840 feet above the Colorado River and is the 2nd largest bridge in the United States at 1,900 feet in length. 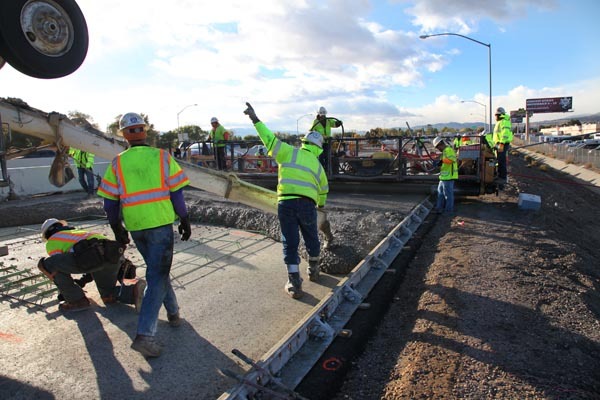 It’s heads up and all hands on deck for an early morning concrete pour on the Moana Lana Diverging Diamond Interchange in Reno, NV. The DDI is an innovative type of interchange designed to move traffic more quickly and safely. Eight reconstructed bridges, roadway reconstruction. 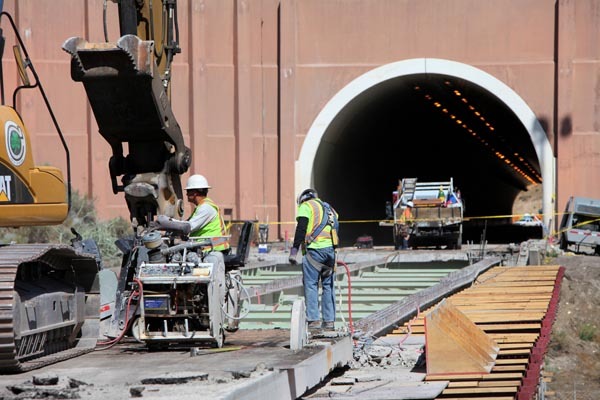 enhanced tunnel lighting and intelligent transportation systems are just some of the Carlin Tunnels Project’s improvements that will enhance the drive for interstate and local traffic traveling this stretch of I-80 in northesastern NV. 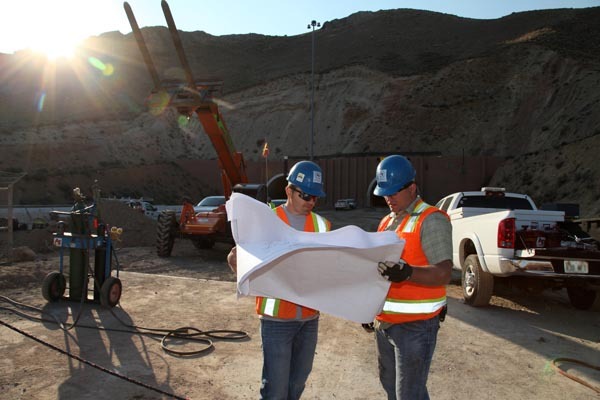 For engineers Weston Southwick and Nathaniel Voss, the morning sun launches another day of dedicated work on the Carlin Tunnels Project, part of more than 50 miles of I-80 improvements in northeastern NV. 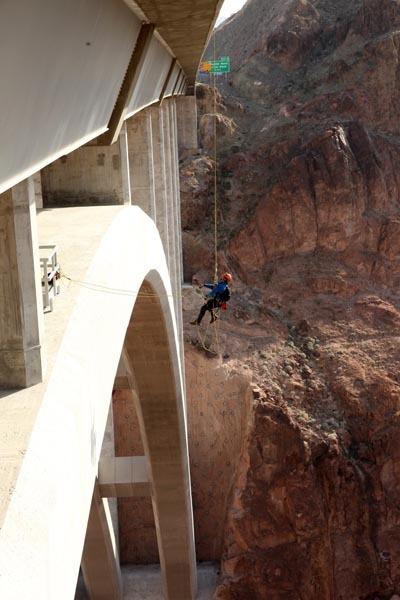 Brave inspector Trask Bradbury hangs out over the Mike O’Callaghan-Pat Tillman Memorial Bridge (Hoover Dam Bypass) during a routine biennial bridge inspection. 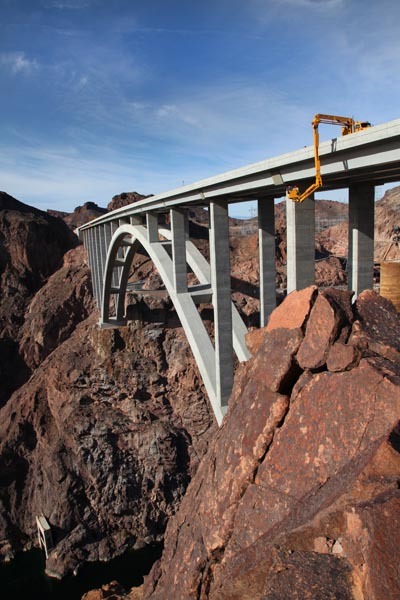 The concrete-steel composite arch bridge looms 840 feet above the Colorado River and is the 2nd largest bridge in the United States at 1,900 feet in length.